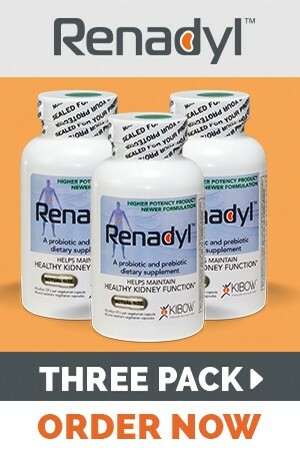 Renadyl is proven to help people with chronic kidney disease by alleviating the burden of toxic waste products which are damaging to the kidneys and the serious side effects of toxic waste buildup in the bloodstream. The probiotics in this supplement have been shown to use nitrogenous wastes such as urea, uric acid, creatinine, indoles, phenols, and nitrosamines and their precursors for their growth in the colon. By growing, the probiotics can multiply and become more efficient at reducing wastes. These wastes and others naturally diffuse from the bloodstream into the bowel, and reduction of those compounds in the bowel results in reduction of the total toxic waste burden on the kidneys. The by-products of the wastes metabolized by the probiotic microbes are eliminated in feces. The former name of this probiotic supplement was “Kibow Biotics”. For more information on caring for chronic kidney disease, including the use of probiotics, see this page. For information on how CKD is assessed, risk factors and early symptoms, see this page. What Probiotic Strains are in Renadyl? What Are the Other Ingredients in This Supplement? The other ingredients at the time of this writing (August, 2016) are inulin and xylooligosaccharide (both prebiotics in undisclosed amounts), magnesium stearate, hypromellose and gellan gum. What is the Recommended Dosage of Renadyl? The manufacturer recommended dosage is 2 – 4 capsules daily with a meal for a minimum of 3 months to realize the full benefits. What Does Research Show for Renadyl? In a private veterinary clinic in 2006, 7 cats with elevated BUN and serum creatinine were given this probiotic supplement for 3 months. While not a randomized, blinded, placebo-controlled trial, 100% of cases showed a decrease in BUN ranging from 4.7% to 36.5%, and 6 out of 7 cats showed decreases in creatinine ranging from 10% to 51.9%. In a small, randomized, double-blind, placebo-controlled crossover study of 22 adults with ESRD on hemodialysis, observed trends of declines in WBC count and reductions in levels of C-reactive protein and total indoxyl glucuronide were noted. These changes did not reach statistical significance. No statistically significant changes were observed in other uremic toxin levels or measures of quality of life based on a modified SF36 questionnaire, although quality of life was said to stabilize. There were two 2-month treatment periods separated by 2-month washout and crossover. Patients were given 2 capsules three times daily with meal of either 30 Billion CFU of the 3 Renadyl probiotics (for a total of 180 billion CFU) or placebo, which consisted interestingly of a 1:1 blend of cream of wheat and psyllium husk. This study suggested that the probiotic supplement is safe to administer to ESRD patients on hemodialysis. In a prospective, randomized, double-blind, crossover, placebo-controlled, multi-center 6-month trial of this probiotic supplement in 13 patients, significant decreases in BUN occurred during the treatment period. Mean changes in uric acid concentration decrease were moderate during the treatment period and changes in serum creatinine concentration were insignificant. No gastrointestinal nor infectious complications were noted in any patient with improved quality of life. In a 6-month prospective, randomized, double-blind, placebo-controlled, multi-center crossover trial on 46 patients, 90 billion CFU of this probiotic supplement was well tolerated and safe at all sites. Statistically significant BUN level decreases were experienced in 63% of patients. Non-significant decreases in creatinine in 43% of patients and in uric acid levels in 33% of patients were noted. Eighty six percent of patients expressed a perceived substantial overall improvement in quality of life based on a questionnaire. In a 2013 open-label dose escalation study, 28 patients in stages 3 and 4 CKD tolerated increasing dosages from 1 capsule of 30 billion CFU three times daily to 3 capsules three times per day (270 billion CFU) and experienced statistically significant changes in serum creatinine, C-reactive protein, hemoglobin and quality of life as measured by physical functioning. The maximum dose was sustained for 2 months. Non-significant decreases in BUN and in pain were also noted. An article in the International Journal of Medical and Applied Sciences in 2014 summarized responses from 147 survey questionnaires from current (at the time) and former customers of Renadyl. The summary showed over 75% satisfaction of safety, perceived efficacy and performance of the product. The majority was over 50 years of age, retired, in at least stage III of kidney disease, and with at least one or several comorbid conditions. The conclusions from the questionnaires were that the probiotic supplement was safe in all stages of CKD, even with comorbid conditions, and it does not interfere with any other medical treatments, including dialysis. Persons who completed the questionnaire were provided a 25% discount on the next order of the supplement which was deemed an appropriate reward for taking the time to complete the questionnaire. This supplement may someday be evaluated for prescription drug status. If Kibow pursues this option, there will be many more, and larger, studies performed. What Are the Pros of Renadyl? The strain names are provided so you know exactly which microbes are efficacious. Other strains of the same species in other products may not have similar effects. Unlike most other probiotic supplements, this one has research to back its use as a whole supplement. Research supports it use for people with chronic kidney disease by alleviating the burden of waste products which are damaging to the kidneys. Contains NO gluten, dairy or sugar. This supplement is not cultured on gluten or dairy, either. Shelf-stable without refrigeration for one month, although refrigeration is recommended. Potency is guaranteed through the expiration date if refrigerated. Compared to other multi-species probiotic supplements, this one contains a higher number of total CFU of 45 billion per capsule. Sold only through the manufacturer or healthcare practitioners like myself so that the product is handled properly and/or markers of CKD can be tracked. Although quality of life appears to improve for CKD users of this product, knowledge of the CKD blood markers can also show the improvements happening in CKD disease management. Normally shipped Monday-Wednesday to minimize weekend transit. Shipment with ice is available upon request. At the time of this writing (August, 2016) there were 28 positive reviews of this probiotic supplement on the product website. 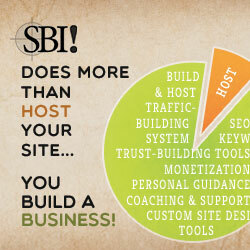 Here is a sample of some of the reviews. Note that GFR is glomerular filtration rate, and it is a calculated indicator of kidney function. A decrease in GFR means worsening of kidney function, whereas an increase means improvement in kidney function. No change in GFR means a stabilization in kidney function. According to the National Kidney Foundation, a GFR over 90 is good, 60-89 should be monitored, and less than 60 for 3 months indicates kidney disease. For more information on GFR, creatinine and chronic kidney disease, see this page. "My daughter had heard about Renadyl and recommended it to me since my Protein values in my kidneys were too high. However,the biggest problem was that I had to urinate every half hour all night long which became more and more frequent. After taking Renadyl for three(3)weeks I noticed alot of improvement and after six (6) weeks I was back to NORMAL. My kidney Protein values are back to normal as well. "I’ve been using Renadyl for a little over 6 months now and blood levels are within the normal range (creatine levels are down). Even my skin tone is back normal (used to have a yellowish skin tone). As with most probiotic supplements, this one requires refrigeration after it is delivered. It is, however, shelf stable for up to one month at 77 degrees F so that it can be safely shipped. As previously mentioned, this probiotic supplement is only sold through healthcare practitioners like myself or through the Renadyl website. Note that 3 bottles are shipped at once and at the time of this writing, free shipping is included. Should you wish to try it, please visit their website and enter the code POP016 (that is P-O-P-zero-one-six) for a 5% discount EACH time you order. Enter the code at the bottom left of the shopping cart screen. If you do not enter the code EACH time you order, Kibow will not apply the discount. This supplement is a high potency supplement, has "safe" species of lactic acid bacteria, is free of some allergens, and very importantly, has research in vitro, in animals and in humans to back up its claims for supporting health in chronic kidney disease or end-stage renal disease. If you would like help in determining if this probiotic supplement is right for you and your CKD, please consider nutritional consultations with me. I can work with your doctor to monitor the effects this supplement will have on your kidney health and help you with dietary and lifestyle considerations. Return to page on caring for your kidneys.